Important news about a new Gorillaz album in the works appeared earlier this week via Jamie Hewlett's Instagram account, after posts of some the virtual band surfaced. 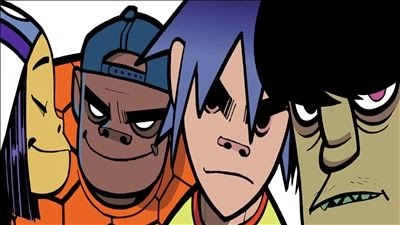 There were new depictions of the surly bass player Murdoc (far right in image from allmusic.com here) as well as teenage gal guitarist Noodle (at far left and fun fact that she has been voiced by Japanese actress Haruka Kuroda, Miho Hatori of trip-hop group Cibo Matto and Talking Heads bassist Tina Weymouth). These characters were joined by a beefy drummer named Russel and 2-D, lead vocalist, keyboardist and alter ego for Damon Albarn of Blur and The Good, the Bad & the Queen. The group was created in 1998 by Hewett with Albarn who had dropped hints that after finishing his solo debut, last year's lovely although mellow Everyday Robots, he would be working on new Gorillaz songs. I remember being transfixed by the first self-titled album's "Clint Eastwood" in 2001 (or rather a year or two later as the tune caught on in the states). It was just like nothing I had heard before, a genre-crossing blend of hip-hop, rap and Blur's Britpop with Albarn's familiar vocals, plus the wacky idea of it all being played by cartoon musicians! "19-2000" was another gem, with its laid back vibe and video of one crazy car ride. To attest to my love for the band, two of my very favorite dance tunes of all time appeared on the second album, 2005's Demon Days. I can't help but move when listening to the non-stop action of "Feel Good Inc." and "Dare." Yet another top pick, "On Melancholy Hill" from 2010's Plastic Beach, is infused with hopeful sweetness, all goodness and light. There is also 2011's The Fall that was recorded entirely on an iPad to check out, and here are the videos for all my faves below.